What do you know: Bill Rice played in the Atlantic League to get back up to the South Atlantic League. Twenty-six games after going from independent ball to the Minors, Rice hit for the cycle in Class A Kannapolis' 14-5 victory in Greensboro. Rice's cycle was the second in the South Atlantic League team's history. Dale Mollenhauer accomplished the feat on July 3, 2008. "Hopefully, this will be just a little stepping stone for me continuing to play pro ball for a long time," Rice said of his first cycle at any level after hopping off the bus back in Kannapolis. "For now, it's my biggest achievement in the game." Starting in right field and batting seventh, Rice pulled a two-run homer to right field on a first-pitch changeup in the second inning and smacked an RBI single in the third against Grasshoppers starter Scott Lyman. The lefty-hitting Rice then doubled and flew out in the Intimidators' eight-run fifth. Facing reliever John Omahen to lead off the eighth, Rice tripled into center field. "After I hit the double, when I [hit the flyout], everyone in the dugout was getting on me: 'Don't think about it, just do it, it's not a big deal,'" Rice said. "They were ragging on me. I'm sure no one thought it would happen. I can remember a million times where a guy needed a double or a triple and didn't do it." Omahen's mistake? Heaving heat plate-ward. "They had been throwing a lot off-speed pitches to me the last two games. It was a 1-1 count, and I was looking for a fastball, and he threw one," Rice said. "It was up out of the zone, but I already felt like I had a successful day, so I was trying to attack the ball. ... It hit off the right-center field wall." And his teammates' reaction afterward? "My bullpen gave me a standing 'O,' when I came into third safely," Rice said. His four hits and three RBIs were both single-game career highs. The native Sewell, N.J., went undrafted out of college and signed with Philadelphia in July 2010. He batted .293 in 35 games for Phillies' Class A affiliate Lakewood in the South Atlantic League last season, but was released last March. Kannapolis swept Lakewood May 31-June 3, and over the four games, Rice went 6-for-11 with six runs, including a longball. In between, Rice reached his last resort: He batted .300 in 17 games for the Camden Riversharks of the unaffiliated Atlantic League. That earned him a free-agent contract with the Sox; he was assigned to Kannapolis on May 28. The biggest difference he's noticed between the two circuits? "There's a big age difference. I think I might have been the youngest guy in the league," the 23-year-old said. "Here, it's more developmental. I am the type of person -- I just want to win." Since then he's batting .340 with an .899 OPS in 26 games. "I feel like I am proving that I deserve another shot," Rice said. "I'm glad the White Sox gave me one." 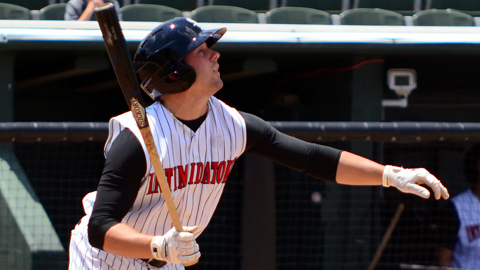 Intimidators starter Erik Johnson (2-2) yielded four runs -- two earned -- on six hits over 5 2/3 frames. The win snapped his team's five-game skid. Lyman (1-4) gave up four runs on six hits over 3 1/3 innings.